We’ve Got Core…Now That Takes Teamwork! We've Got Core…Now That Takes Teamwork! The seafloor is spreading! The seafloor is spreading! To find out what this means, read on. Let’s say you were an invisible, gigantic surfer who instead of surfing on waves, likes to surf on currents that move slower than you fingernails grow, but that speed is fun for you because you live for hundreds of millions of years. Also, you do not like to surf on liquid but instead you prefer to surf on stuff that is the consistency of Silly Putty. As the current of Silly Putty moves your surfboard, it will periodically break open gaps in the surfboard, which the Silly Putty then rises into, hardens and becomes new surfboard, and you think this is totally gnarly. If by chance an invisible giant who meets these criteria is reading this blog, then the ocean floor is your perfect surfboard. The ocean floor is part of the lithosphere, which sits upon the asthenosphere. The asthenosphere is made up of molten rock that is not liquid, but is more like Silly Putty. Even though the molten rock in the asthenosphere is Silly Puttyesque, it can move. As you probably know, heat rises (which is why a cold air balloon is not going to go anywhere). 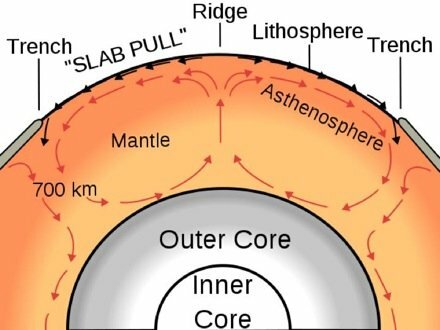 The molten material down near the core becomes really hot and rises up to the lithosphere. The lithosphere then becomes weaker in the places where all that hot, molten rock is pushing up against it. The lithosphere is like a ceiling, though, that stops the current of asthenosphere from breaking through and causes it to flow along underneath the lithosphere. As the current flows under the lithosphere, it actually drags the lithosphere with it, like a giant surfboard riding a really slow wave. When the lithosphere is dragged, it does not stretch, so it ends up breaking open in the same weak spot where the asthenosphere current first rises up to meet it. Some of the asthenosphere then rises into the gap in the lithosphere as lava. When the lava comes in contact with ocean water it immediately cools into rock, adding to the ocean floor and causing it to spread out. So if the seafloors are spreading all over the world (and they are) does that mean that at some point the earth is going to be entirely covered by seafloor? The answer is no. To find out why, read my next blog.